We advance and re-define engineering and computing education to ensure that all students receive the best possible preparation for their future. ASEE and IEEE unite to create an inclusive venue where excellence in research, teaching, and creative activity are valued. We bring together a multidisciplinary global community committed to improving scholarship and practice in engineering and computing education. Remaining free from bias and conflict of interest. The Frontiers in Education conference (FIE) is a well-respected international conference on engineering and computer science education. 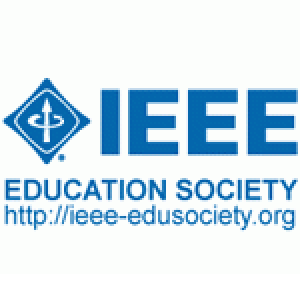 The IEEE Education Society founded the conference in 1971. The American Society for Engineering Education joined as a co-sponsor in 1973. For more than two decades, these two sponsoring societies held the conference in various locations around the United States and, occasionally, in international venues. In 1995, the IEEE Computer Society became a sponsor and together these three groups have continued to plan high quality events that provide engineering and computer science educators the opportunity to network and showcase peer-reviewed scholarly contributions in educational research and classroom practice. In 2013, the FIE Steering Committee formed formal policy that places FIE within the continental United States with the possibility of an international location at five year intervals. The educational research and the educational practice literature generated by FIE is regularly cited in scholarly work and helped to inspire a well-regarded textbook in engineering education written by John Heywood and published by Wiley-IEEE Press (ISBN: 978-0-471-74111-4). FIE uses a two-stage review process that begins with the issuance of a call-for-papers in June of the year preceding the conference. The first stage requires submission of a short abstract that is then peer-reviewed by the technical program committee for appropriateness to the conference, the yearly theme, new and engaging ideas, and so on. Abstracts that are selected are invited to submit full papers and works-in-progress (short papers) for blind peer-review. A blind peer review means that reviewers can see the names of the authors but the authors are not told the names of the reviewers. Table 1 provides acceptance information for the past seven years. Note that FIE accept rate is quoted based on the full two-level peer review of acceptable papers. Thus, in 2014, 895 abstracts were deemed appropriate to move to full-paper creation and peer-review. After peer-review, 480 / 895 = 57% of the original author contacts result in published work. The acceptance rate is also plotted with a trend line. 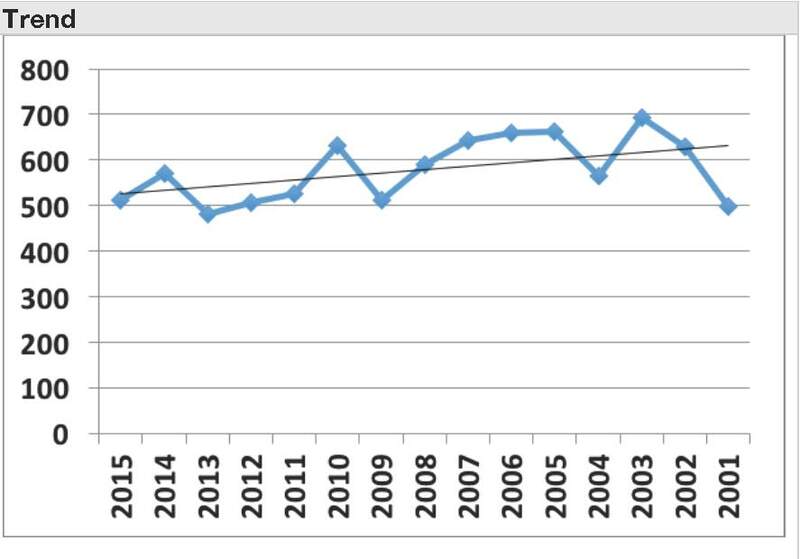 The slight upward trend is caused by the 2013 outlier year. 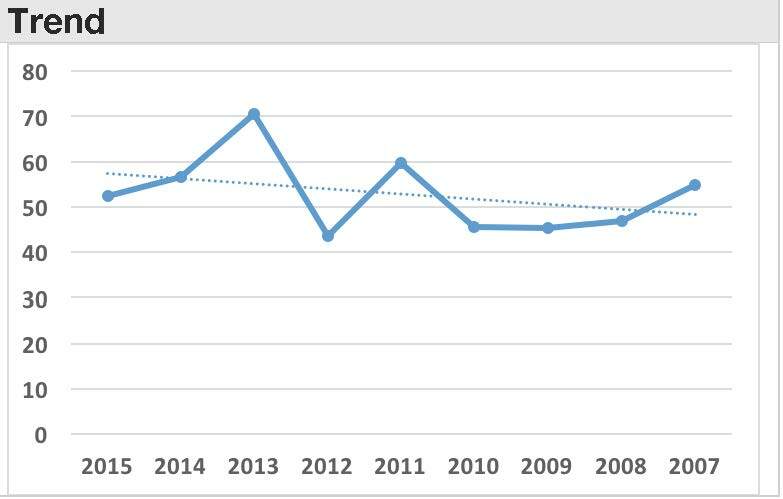 The overall trend line has an upward directional slope but is a nearly horizontal line with an average around 50% when the outlier is removed. The Frontiers in Education Conference is one of the world’s premier conference events covering the areas of engineering, computer engineering, software engineering, and computer science education. It has a loyal author and attendee base. Registrations have remained relatively constant over the past fifteen years. This is remarkable when the worldwide economic recession is considered. The reason is the sense of community that FIE provides to attendees: the high quality technical papers consistently provide state-of-the-art conversation in education, the registration fee has remained relatively affordable, and registration pays for an opening reception, three breakfasts, three lunches, all coffee and refreshment breaks, as well as the conference bag, the proceedings, an exhibit hall, free wireless internet, and other similar amenities. Registrants consistently compliment FIE on the common food functions that foster a sense of camaraderie and provide ample opportunity for participant networking. Table 2 provides the statistical summary of FIE registration in the 21st century. The trend line is nearly horizontal with an average attendance of 576 people.